How about this for a second take? It was also asked – why? Not sure, I like the idea of being marked as my Master’s property, but I don’t want something as twee as "Sir’s Boi" or something. 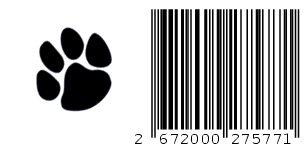 The barcode is advantageous because it lends itself to the objectification of me as a slave but it’s also Master independent, not that I have any intention of changing Masters! 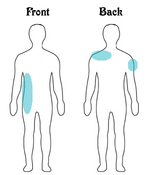 I’d suggest the upper right arm then from the three places you gave as options. what do you say? why not being the first RFID slave?